Our brief was to design a method selection tool for OP Financial Group (OP) and their in-house design unit, so OP designers can strive towards better customer-centric design. During the research, our main understanding was that OP designers want to be more effective at selecting a method. They want to feel assured in choosing a method that would work best in the project or case that they are working on at any given moment. Our design aims to streamline a method selection process that helps OP develop customer insights more effectively and enables OP designers to feel comfortable trying a new method. 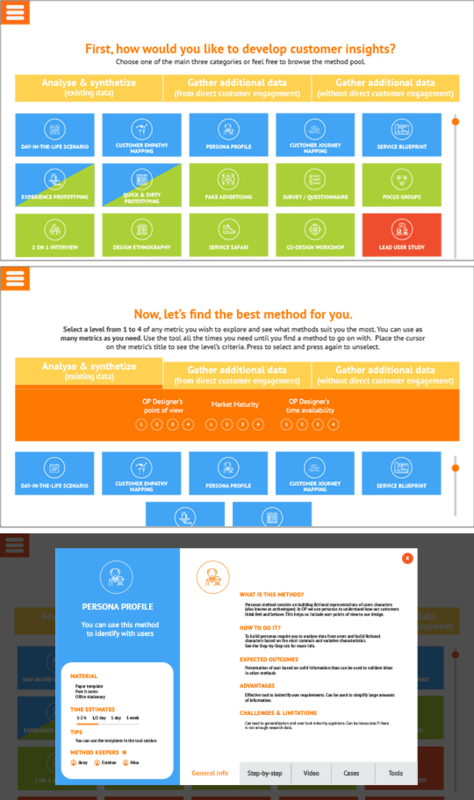 First, we established the OP Pool of Methods which consists of 20 methods for developing customer insights. We believe 20 is a manageable number for OP designers to get familiar with. Also, an established set helps build a shared and clear understanding of “OP ways” of doing customer-centric design. This is more efficient and effective than selecting from hundreds of methods since some of them may not be applicable for OP for the purpose of generating customer insights. 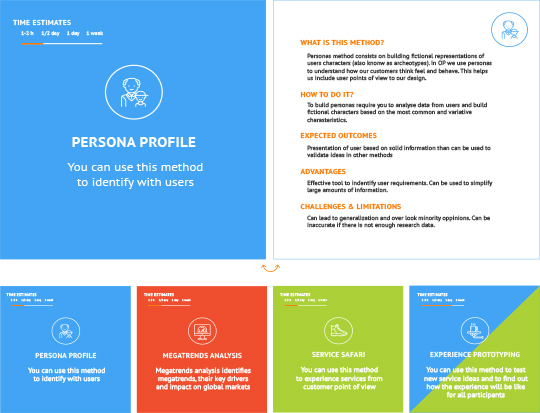 Our method selection tool is an online platform where any OP designer can use to select customer insight methods. The tool can be used as many times as necessary during a project depending on OP designer’s needs, at any stage of the project. Through multiple use of the selection tool multiple combinations of methods can be used throughout a project, thereby employing method mixing strategies. Our selection tool uses two stages of filtering. Stage 1 addresses the user’s intention by asking “how would you like to develop customer insights?”. At this stage, the 20 methods are divided into 3 categories: analyzing and synthesizing existing data; getting additional data from direct customer engagement; and getting additional data without direct customer engagement. Stage 2 addresses additional metrics using a scale rating system of 1 to 4. The methods can be narrowed down until there is one method left. A method card in both online and print formats, includes information about a method in an easy to understand manner. In addition, our design proposal recommends to assign a Method Keeper when a project team is assembled. The method keeper is responsible for understanding the method being used, providing feedback on its use, and making notes or media recordings on its usage. If the method keeper leaves the project, another person will be assigned to the role within the project team. Method Keepers are valuable because it helps OP designers feel more comfortable trying a new method by knowing that someone else in the company has tried the method previously. They have the option to have a conversation about the method together.